For the 1983 collection of Gordon R. Dickson stories, see The Man from Earth (short story collection). The Man from Earth is a 2007 American drama science fiction film written by Jerome Bixby and directed by Richard Schenkman. It stars David Lee Smith as John Oldman, the protagonist. The screenplay was conceived by Jerome Bixby in 1946 and completed on his deathbed in April 1998. The film gained recognition in part for being widely distributed through Internet peer-to-peer networks, which raised its profile. The film was later adapted by Schenkman into a stage play of the same name. The plot focuses on John Oldman, a departing university professor, who claims to be a Cro-Magnon (or Magdalenian caveman) who has secretly survived for more than 14,000 years. The entire film is set in and around Oldman's house during his farewell party and is composed almost entirely of dialogue. The plot advances through intellectual arguments between Oldman and his fellow faculty members. Professor John Oldman is packing his belongings onto his truck, preparing to move to a new home. His colleagues show up to give him an impromptu farewell party: Harry, a biologist; Edith, an art history professor and devout Christian; Dan, an anthropologist; Sandy, a historian who is in love with John; Art, an archaeologist; and his student Linda. As John's colleagues press him to explain the reason for his departure, he picks up from a reference to Magdalenian cultures by Dan and slowly, and somewhat reluctantly, reveals that he is a prehistoric caveman himself from that precise period. He states that he has lived for more than 14 millennia, and that he relocates every ten years to keep others from realizing that he does not age. He begins his tale under the guise of a possible science-fiction story, but eventually stops speaking in hypotheticals and begins answering questions from a first-person perspective. His colleagues refuse to believe his story but accept it as a working hypothesis in order to glean his true intentions. John relates he was a Sumerian for 2000 years, later a Babylonian, and eventually went East to become a disciple of the Buddha. He claims to have had a chance to sail with Columbus (admitting that at the time he still believed the earth was flat) and to have befriended Van Gogh (one of whose original paintings he apparently owns, a gift from the artist himself). In the course of the conversation, each guest questions John's story based on knowledge from their own academic specialty. Harry struggles with how biology could allow for the possibility of a human being living for so long. Art, arguably the most skeptical of the group, questions John about events in prehistory. He exclaims that John's answers, though correct, could have come from any textbook; John rejoins that, like any human, his memory is imperfect and he only sees events from his own narrow, hence not omniscient perspective. Dr. Will Gruber, a psychiatry professor who arrives at Art's request later that afternoon, questions if John feels guilt for outliving everyone he has ever known and loved. He then threatens John with a gun (later revealed to have been unloaded) before temporarily leaving. John then learns from Harry that Will's wife had died the previous day after a long illness. The discussion veers to religion, and John mentions that he does not follow any. Even though he does not necessarily believe in an omnipotent God, he does not discount the possibility of such a being's existence. Pressed by the group, John reluctantly reveals that in trying to take the Buddha's teachings to the west, into the eastern Roman Empire, he became the inspiration for the Jesus story. After this revelation, emotions in the room run high. Edith begins crying. Will demands that John end his tale and give the group a sense of closure by admitting it was all a hoax, and threatens to have John involuntarily committed for psychiatric evaluation should he refuse to do so. John appears to ruminate over his response before finally "confessing" to everyone that his story was a prank. John's friends leave the party with various reactions: Edith is relieved; Harry and Dan indicate an open mind; Art never wants to see John again; Will still believes John needs professional help; Sandy and Linda clearly believe John. After everyone else but Will and Sandy have left, Will overhears John and Sandy's conversation, which suggests the story could be true after all. John mentions some of the pseudonyms he has used over the years, and Will realizes one was his father's name. He asks John questions that only a very close acquaintance could answer. When John answers them correctly, Will has an emotional breakdown, suffers a heart attack and dies in their arms. After the body has been taken away, Sandy realizes that (if the story is true) this is the first time John has seen one of his grown children die. John wordlessly gets in his truck and starts to drive to an unknown destination. Then he stops and waits for Sandy, who walks over to the truck and departs with him. The film screened at the San Diego Comic-Con Film Festival in July 2007, and premiered theatrically in Hemet, California, and Pitman, New Jersey, in October 2007. It was released on DVD in North America by Anchor Bay Entertainment on November 13, 2007, and became available for digital rental and sale at iTunes on September 22, 2009. It won the grand prize for Best Screenplay and first place for Best Feature at the Rhode Island Film Festival in August 2007. In 2007, producer Eric D. Wilkinson publicly thanked users of BitTorrent who distributed the film without express permission, saying that it lifted the profile of the film far beyond the financier's expectations; he encouraged fans to purchase the DVD or donate. IGN gave it an 8 out of 10, calling it "intellectual sci-fi". DVD Verdict criticized the heavy-handed ending, saying that one's opinion of the film would be shaped by views on religion. The film has been nominated for and won numerous awards. All music performed by Mark Hinton Stewart. Copyright - BDI Music LTD. In 2012, Richard Schenkman adapted the film to a play, which received positive reviews. The theater play was also staged in Greece in 2013 . A sequel, The Man from Earth: Holocene was released in 2017. Filming began on June 2, 2016 and ended on June 16. The producers have stated on Facebook that it may be the first in a series. This followed two previous attempts at producing sequels. A Kickstarter campaign to crowdfund a sequel named The Man From Earth II: Man From Earth Millennium was announced in September 2013, but it was not able to collect the minimum-required supporting by October 2013. Another attempt was then made to crowdfund a series, Man From Earth: The Series, based on the film. The second crowd-funding effort completed successfully in August 2014. ^ a b Fernandez, Jay A. (2007-07-25). "A sci-fi writer's final words are brought to life". Los Angeles Times. Retrieved 2008-01-07. ^ "The Man From Earth (About)". Manfromearth.com. Archived from the original on 2012-12-28. Retrieved 2015-11-29. ^ Movie producer from Newfield releases sci-fi film November 1, 2007 by Senitra Horbrook at Gloucester County Times. 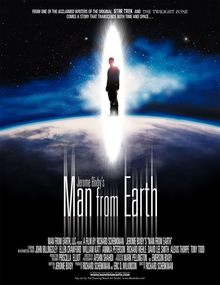 ^ ""Jerome Bixby's The Man from Earth" on DVD Nov. 13". StarTrek.com / CBS Studios, Inc. 2007-10-26. Retrieved 2008-01-07. ^ "Producer Thanks Pirates For Stealing His Film". TorrentFreak. 2007-11-13. Retrieved 2012-03-24. ^ "Piracy isn't THAT bad and they know it". RLSLOG.net. Retrieved 2012-03-24. ^ Teh, Hock (November 6, 2007). "The Man From Earth DVD Review". IGN.com. Retrieved 2 June 2013. ^ Stewart, James A. (November 13, 2007). "The Man From Earth". DVD Verdict. Archived from the original on 18 November 2007. Retrieved 2 June 2013. ^ Isenberg, Robert. "The Man From Earth". Pittsburgh City Paper. Retrieved 2 June 2013. ^ "The Man From Earth: Holocene | Facebook". www.facebook.com. Retrieved 2016-09-06. ^ Lowe, Alexander (2013-10-02). "The Man From Earth II: Man From Earth Millennium Launches Kickstarter Campaign". We Got This Covered. Retrieved 2015-05-24. ^ "The Man From Earth II: Man From Earth Millennium". Kickstarter. Retrieved 2015-05-24. ^ Lowe, Alexander (2014-07-24). "Man From Earth: The Series Gets A Kickstarter Campaign". We Got This Covered. Retrieved 2015-05-24. ^ "Kickstarter campaign for Man from Earth the Series". Kickstarter. Retrieved 2015-05-24.